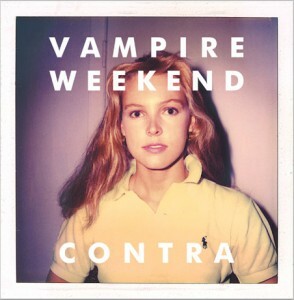 Contra is one of those rare albums that hits you upside the head the first time you hear it. Vampire Weekend did that to me with their first album, and to have it happen a second time is unheard of. The head-smack starts from the opening line: “In December drinking horchata, I’d look psychotic in a balaclava.” I have had this line haunt me obsessively in my sleep, and I have no clue why. But it won’t leave once it gets in there! All the African-rhythms-by-way-of-Paul-Simon are still here (plus bonus Vocoder and M.I.A. sample this time). Some of the yelps and vocalizations are so weird that you ask yourself why you like them, but you like them anyway. What’s more, the nutso intellectual references are also still here; on the last album it was the Oxford Comma, now they are namechecking FONTS – 96 point Futura to be exact. Even the album art is in on the same action – again, some ultra-modern but simultaneously ultra-retro photo. I did not expect to be struck by ear-crack twice… but I was, I really was.